Suki is the most sophisticated cat in town. She can trace her line back to Noah’s Ark ! She sleeps on a silk cushion, she eats three course meals (fish, meat and chocolate mouse) and her left overs are given to the dog. Barney is an alley cat. He fights for his dinner and he really enjoys the fish heads and other scraps because he earns them. One day Barney ventures into Suki’s garden. When they meet it is love at first sight.Suki is the most beautiful thing Barney has ever seen, Barney is, in Suki’s eyes a real cat – a cats cat. 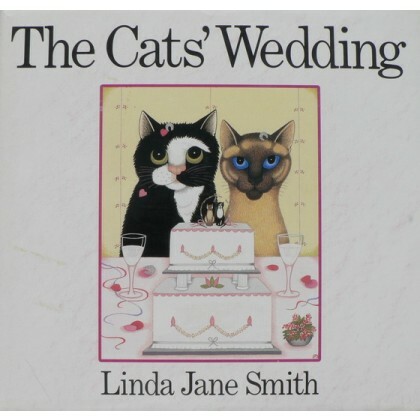 But the course of love is never smooth but as cats always land on their feet so, in the end, love conquers all and the marriage of Suki and Barney is the wedding of the year ! This childrens book has 31 pages with large print and brilliant pictures and makes great bedtime reading. This hardbacked book was published in 1989 and has had only light use and is in good condition.